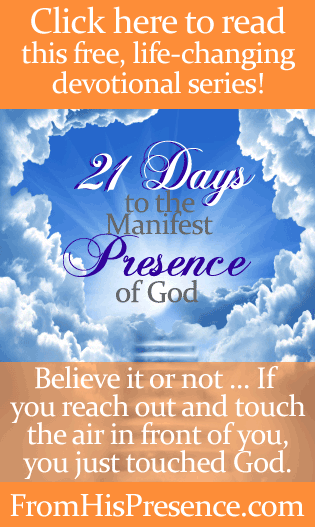 Hello and welcome to 21 Days To The Manifest Presence of God! 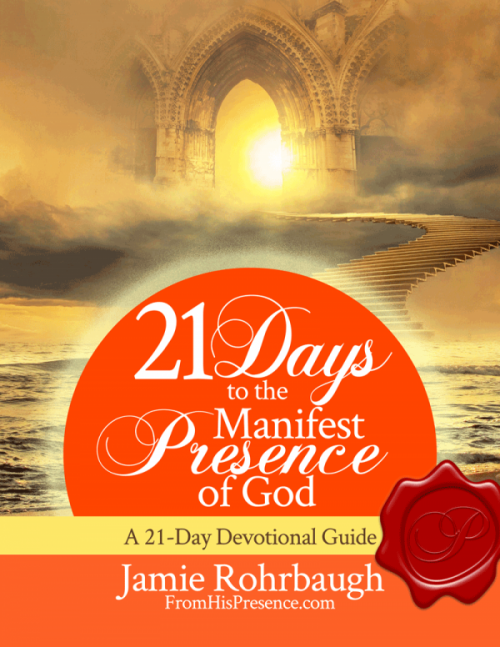 This free devotional series will help you live every moment of every day, the rest of your life, fully aware of God’s manifest Presence and love. Just so you know, this journey might mess you up (in a really good way)! Becoming aware of God’s manifest Presence changed my life, and I believe it will change yours too! Here is a list of all the posts in my series “21 Days to the Manifest Presence of God.” They are all important, so be sure to read them all! You can also get this series in convenient, instantly-downloadable e-book format (PDF) from my Gumroad store, here. And finally, if this series blesses you, please feel free to comment on the individual posts that speak to you? I’d love to hear from you! Amen. Becoming aware of God’s presence changed everything for me. I believe it will for every other person as well. 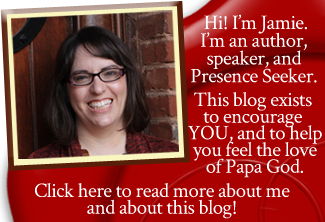 Thank you for reading, and I pray the Holy Spirit will minister to you powerfully! I found your website through Pinterest and am so glad I did. It was the Lord who led me to it. I feel like a kid in a candy store. ‘Where should I read first ? Oh my gosh everything looks so good to eat.’ I look forward to reading more and more but I want to take it at a pace so I can absorb it and digest it. Hi Carol! Thank you so much for reading. I’m sorry it took me so long to respond. I’m in the middle of nowhere for the weekend with very little internet reception. But your comment made my day. Candy store, lol! That’s great. Thank You, Daddy God, for blessing my sister. I pray the Holy Spirit will encourage and strengthen you over and over, every time you read. 🙂 Have an amazing day!!! I am presently going through my own dark valley and I just did the exercise. WOW. Immediately, came in my mind of a scene of Jesus and a little girl who was me under a dark, vast night sky. Jesus hugged me tightly and said, “I love you more than your parents do. I love you more than (my partner’s name) does. I love you more than this whole universe you see on the sky. Do not fear my child. In me, you find everything.” And his hug was so tight and reassuring. And He lifted me up in His arms and carried me, continued to talk to me, “My child, you feel like you have nothing to hold onto in this darkness but look below you.” I looked and I saw that we were moving in air but He was hugging and carrying me tightly. And we landed onto soft ground again. Right before us was a forest of lights. We went into the forest and the lights shone on His face. He put me down, smiled and rubbed His face against mine. I didn’t understand the significance of the lights until shortly after, the verse from Matthew 5:14 came into mind: You are the light of the world. I cannot create an account no matter what I do. And can’t choose mp3s for purchase. Doing the University course and want to be able to keep up. Help! Thank you. Hi Loretta! I’ll email you. I’m sorry you’re having difficulty but I think we can work it right out for you! Rending of clothing is a sign of great mourning. The rending of the veil from the top to the bottom at the crucifixion of Jesus opened the way to the Father for all believers. The sewing of this very curtain had been ordained of God. This curtain was sown with thread of beaten gold. No man could have rent it. It had to be Almighty God” God is good, I never been this happy.